Native to the Asian continent, buckwheat (Fagopyrum esculentum) is a favorite ingredient of Asian cuisine. Japanese, Korean, Chinese and traditional Tibetan cuisines continue to use it as a popular replacement for wheat as it is not only is it easy to digest, but it also helps regulate blood sugar levels, improves digestion and regulates intestinal transit to name a few of its health benefits. All most of us know about buckwheat is that it is gluten-free, which is why it is highly recommended for people with an allergy or sensitivity to gluten or for those who are suffering from celiac disease. Nevertheless, buckwheat is much more than a gluten-free replacement for wheat and including it in your diet can have major, positive effects on overall health, ranging from cardiovascular to digestive benefits. Buckwheat was a popular culture in the past and old beliefs have even risen it on a sort of pedestal, enshrouding it in mystery. For instance, buckwheat would be used in witches’ rituals and peasants believed that it could ward off evil spirits. For this reason, it was a symbol of fairness and harmony and the mark of white magic. Aside from these old beliefs, buckwheat has real health benefits. For instance, it contains linoleic acid, an Omega-6 fatty acid, as well as vitamins B1, B2, B3 and B5. Basically, B-group vitamins ensure the proper distribution of energy throughout the body and thus prevent fatigue and other milder symptoms of tiredness. Moreover, buckwheat is a rich source of minerals such as calcium, iron, magnesium, phosphorus, potassium and zinc. Calcium promotes strong, healthy bones and teeth, while magnesium ensures the proper functioning of muscles, heart-included. Also, magnesium optimizes the absorption of both calcium and potassium. The cereal also boasts generous amounts of phosphorus and potassium. As you may already know from previous articles, potassium is vital for a healthy heart because it regulates blood pressure and body fluids. In addition to this, buckwheat contains inositol, a substance with potent vitamin activity. Inositol protects the liver and reduces high cholesterol levels; moreover, it is used to treat serious mental conditions (Alzheimer’s Disease, schizophrenia), and even hormonal problems (polycystic ovary syndrome). Buckwheat also contains essential amino acids, substances our body cannot synthesize, but requires in order to function properly. 1) Buckwheat contains easily digestible proteins which is why it is considered to be a great substitute for meat. 2) The rutin extracted from buckwheat leaves is used for the treatment of high blood pressure. Rutin and its derivatives reinforce capillary walls, thus reducing symptoms of bleeding linked to conditions such as hematoma or hemorrhoids. 3) Buckwheat is hypoallergenic which is why it is used as pillow stuffing material for those allergic to feathers, as well as dust and pollen. In this respect, it is less likely to cause food allergies. 4) Buckwheat is believed to help manage diabetes by lowering blood sugar levels. This is owed, in part, to its dietary fiber content. Dietary fiber decreases the intestinal absorption of sugars, contributing to better glycemin control. 5) Because it increases appetite, cleanses and strengthens the intestines, buckwheat is the prerequisite for a good digestion. Also, it can be used as a natural treatment for dysentery and chronic diarrhea due to its high potassium content which helps regulate body fluids. 6) Unlike other pseudocereals and cereals, buckwheat has such a rapid growth that it usually does not require the use of pesticides in order to protect it from pests. This makes it an even healthier choice. 7) Buckwheat is a great choice for a winter meal because it supplies the body with sufficient nutrients to meet our body’s demands during the cold weather. 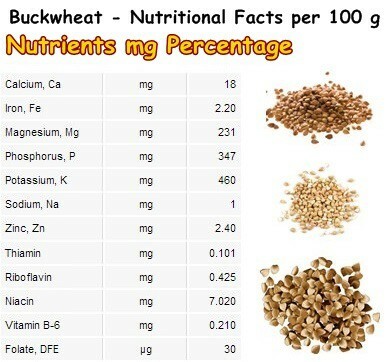 8) Buckwheat is a wonderful source of fiber: 1 cup of cooked buckwheat can provide around 4 g of fiber. Dietary fiber regulates bowel movements, prevents the absorption of cholesterol at the intestinal level and promotes colon health by reducing the time it is exposed to waste. 9) Buckwheat contains all 8 essential amino acids. Amino acids are the basis for protein structure, which makes up 20% of our body. They cannot be synthesized by the body, which is why we take them from our diet. Amino acids carry out an incredibly wide range of essential processes necessary for basic survival. For instance, they support the immune system, cell structure, hormone production and nutrient absorption process, all of which are basic survival functions. 10) Last but not least, buckwheat is a gluten-free pseudocereal, although it can be turned into flour and used for the same purposes as true cereals. Other pseudocereals are quinoa and amaranth. True cereals include: wheat, maize, barley, rice, rye, oats and so on. which is why you should never cave under the pressure exerted by the media regarding what is and what is not healthy for you. Try eating buckwheat for, let’s say, a week and listen to what your body is telling you because it knows best what it needs.